Every six weeks M.A.R.S. makes a run to C&J Feed for the assorted bags of food necessary to keep all our feathered friends happy and healthy. Products with the names Lafeber, Higgins, Roudybush, Kaytee, Hampton Farms peanuts and Mazuri are loaded into our truck (no delivery charge that way). The total of these products is a whopping $606.00, and yes, that is after our discount is applied. The above does not include all the other necessary items such as fresh fruit and vegies, additional protein such as chicken legs or and occasional steak, (Clyde’s) favorite, I will explain that in a later story. Also not included are special treats such as banana, cornbread and fresh ground peanut butter all available from Publix Supermarket which is totally safe. With all that said, a picture is worth a thousand words. 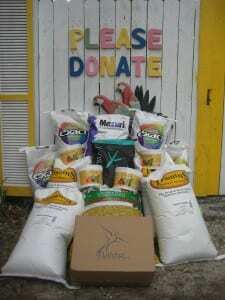 Please donate to our cause and help feed our hungry critters by paying for the above necessary items. If you can, also consider sponsoring a M.A.R.S. parrot or becoming a member of Melbourne Aviary Rescue Sanctuary by visiting our forms page. It is our sincerest hope that you will help us maintain and achieve our goals entering into our third year of rescuing, rehabilitating and finding forever homes through adoption.